Before I got stuck into writing my graphic memoir, I did a few one-off pages exploring ideas from the story to help get me started. I’m interested in euphemisms and phrases regarding miscarriage and their possible impact. The word ‘miscarriage’ is already a euphemism or sorts – a lay-term for the medical ‘spontaneous abortion’. I find the word ‘miscarriage’ fairly acceptable although it does have a ‘whoops’ quality to it, as if one had carried something carelessly and dropped it! Words probably affect people in different ways depending on their personality, life experience and background. For someone who has high expectations of themselves, or who has been trying to conceive for a long time, the term ‘failed pregnancy’ might seem calculating or too reminiscent of exam results! 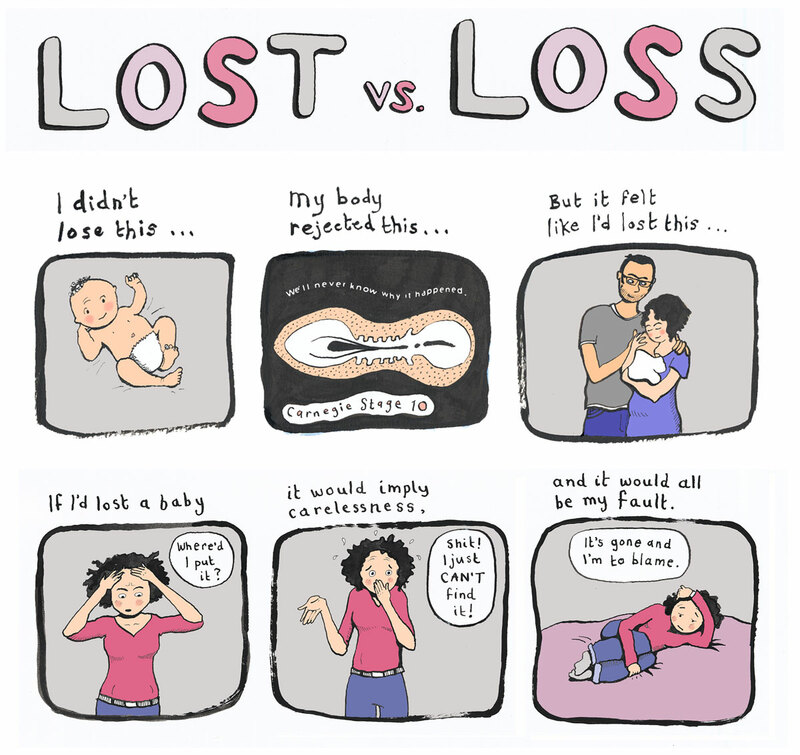 The term ‘lost a baby’ (verb) causes problems because it could seem blaming, although the idea of ‘loss’ (noun) as something one feels after a miscarriage is more fitting. Any suggestion of blame is best avoided when talking about miscarriage – it’s all too easy for a woman to search for reasons among things she has supposedly done wrong. It’s rarely the case (or so I was told) that it’s the woman’s fault. The images used here are collected in my self-published comic, X Utero, available here in my shop, or from Orbital Comics, London. This entry was posted in comics, The Facts of Life and tagged Art, comic strip, comics, comics and medicine, euphemism, failure, family, Graphic Medicine, graphic novels, miscarriage, pregnancy loss, reproductive health, sequential art, writing by Paula Knight. Bookmark the permalink. Missed abortion is the worst – though it refers to the foetus self-aborting, the word abortion is enough to make people assume you DID have something to do with it! What a beautifully written post Paula, and the artwork is incredible. ‘Lost’ is such a pathetic word isn’t it – I hate it when people talk of ‘losing’ someone when they’ve died for exactly the reasons you express so eloquently above. I can’t wait for someone intelligent to snap up this book and get it published. Thanks Imogen, It’s interesting to get your pov! I suppose medical-speak is often necessarily cold in order to be protective amidst a constant onslaught of emotive situations. Thank you kindly Ms Narwhal! I love this. The only thing you are missing is “A higher power has a plan”. I have heard that so many times. I just want to scream when someone says that to me. It’s gotten to the point with my last miscarriage I didn’t tell anyone (besides my hubby) because to carry that alone was easier than dealing with the well meaning idiots. Hello, Thank you for looking at my blog, and glad you liked it. Yes, it says a lot when you’d prefer to keep quiet about the situation rather than having to hear all the wrong responses! And I’m so sorry to hear about your miscarriages.